Able to pull back and forth only several times on the sharpener,your knife will be sharpen. 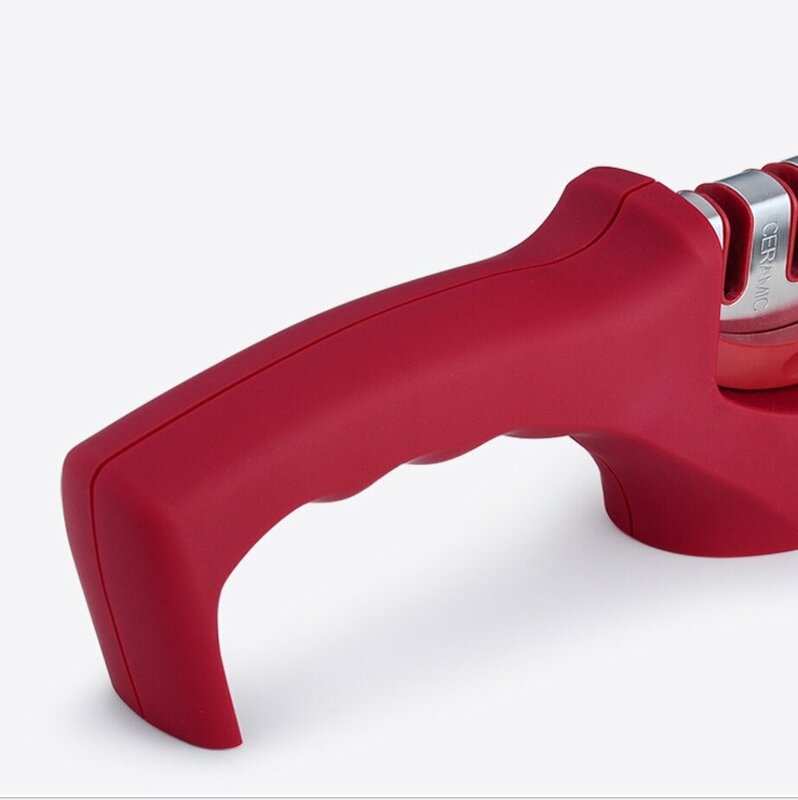 Detachable system makes cleaning easily,effortless operation of knife polishing. 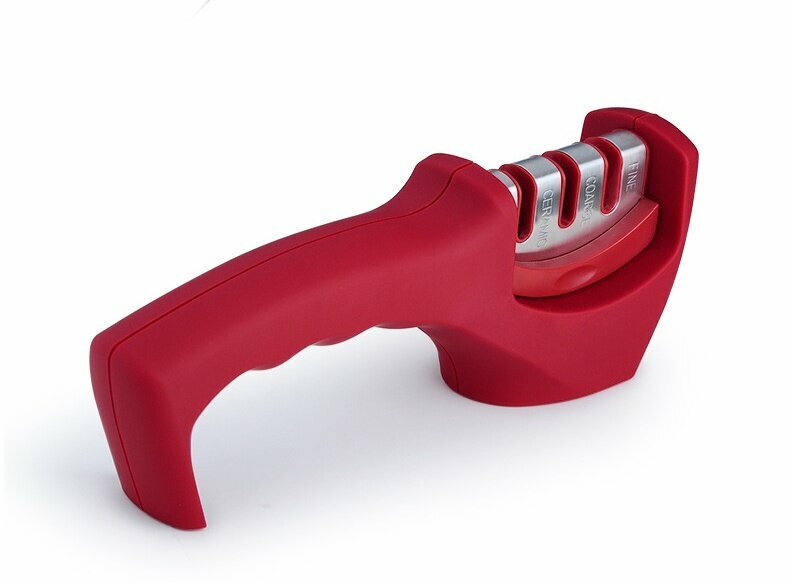 Mulitifuction sharpener:your sharpener fit all kinds and levels of knife, make fast-polishing or meticulous-polishing. The ergonomic handle make your hands feel comfortable,and the material of ABS make slide-proof. 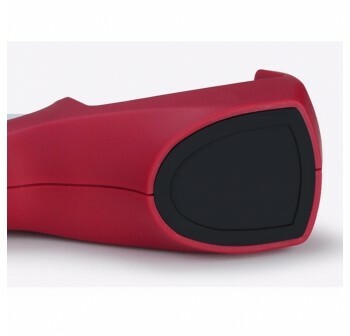 The part of polish employ Tungsten Steel Ceramic and Carborundum. 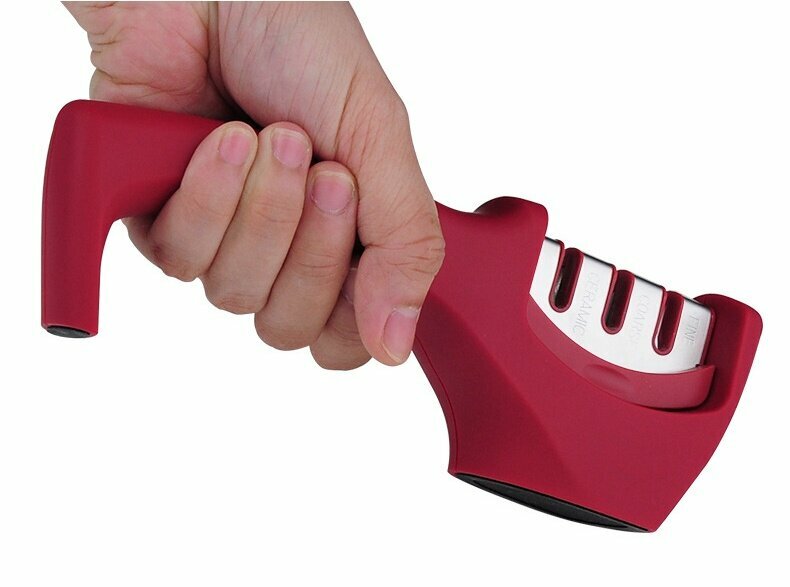 Do you find yourself frantically sawing away at your meat and veggies? Then it’s about time you got your blades sharpened; and the 3 stage knife sharpener is the perfect tool for this! 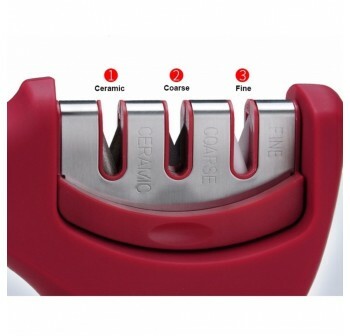 It features a 3-stage sharpening system that allows you to quickly get your blades in perfect condition. The first slot features a diamond rod to work ceramic blades. 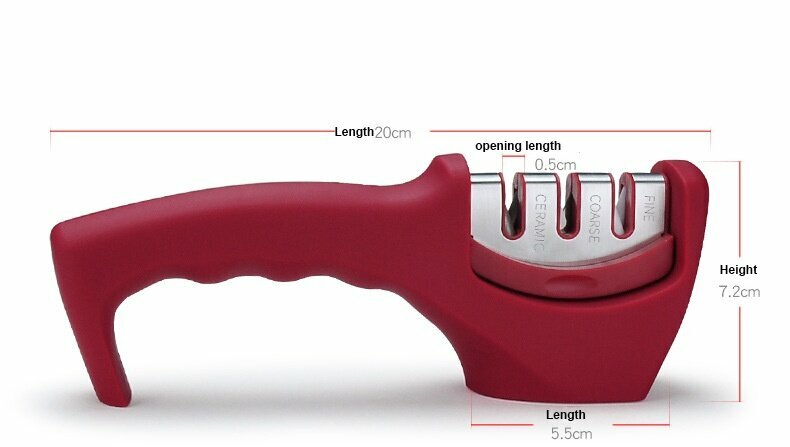 The second one brings extra-dull knives back to life using a tungsten carbide rod. 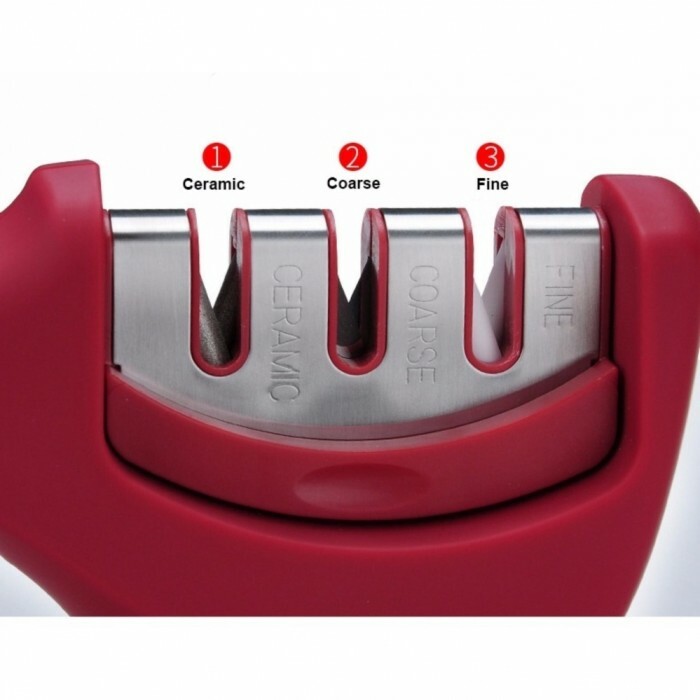 And the third slot is designed to give sharp blades a razor-sharp edge using a ceramic sharpening stone. Are you afraid of cutting yourself when honing your knife? Relax, you don’t have to be! 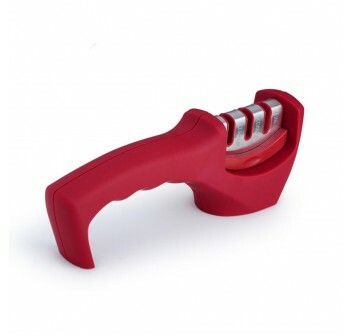 We’ve designed this knife sharpener to be as safe as can be. It comes with an ergonomic handle that gives you superior grip, and keeps your hand away from the blade thanks to its length. 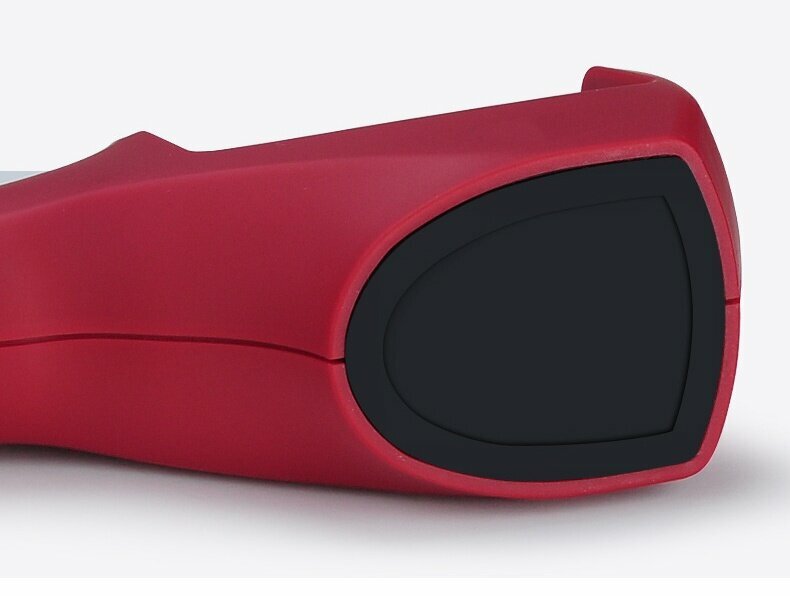 The base is also rubberized to provide maximum stability. 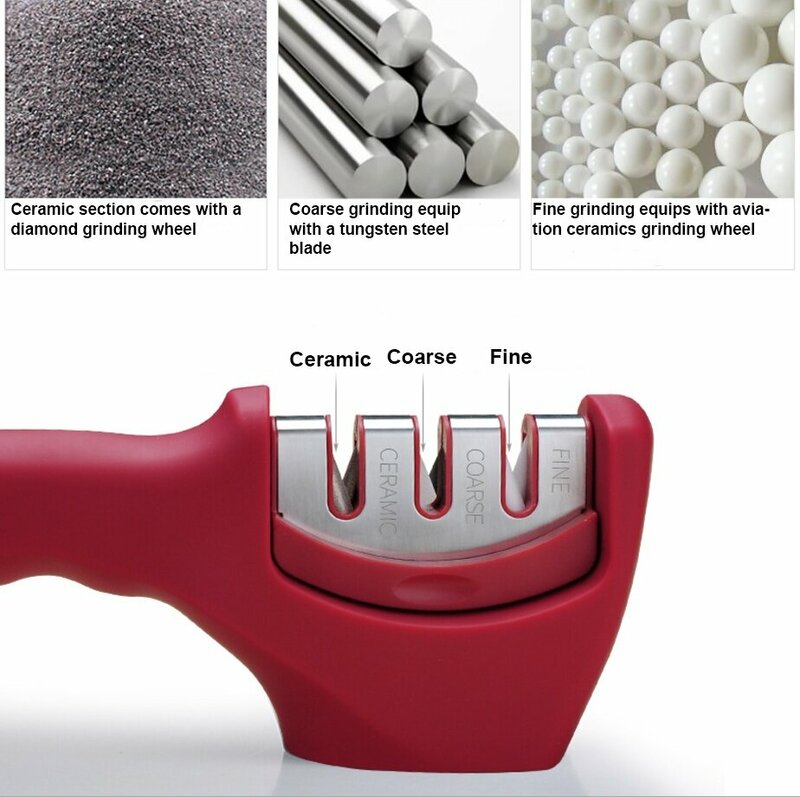 No more dealing with risky sharpening stones! 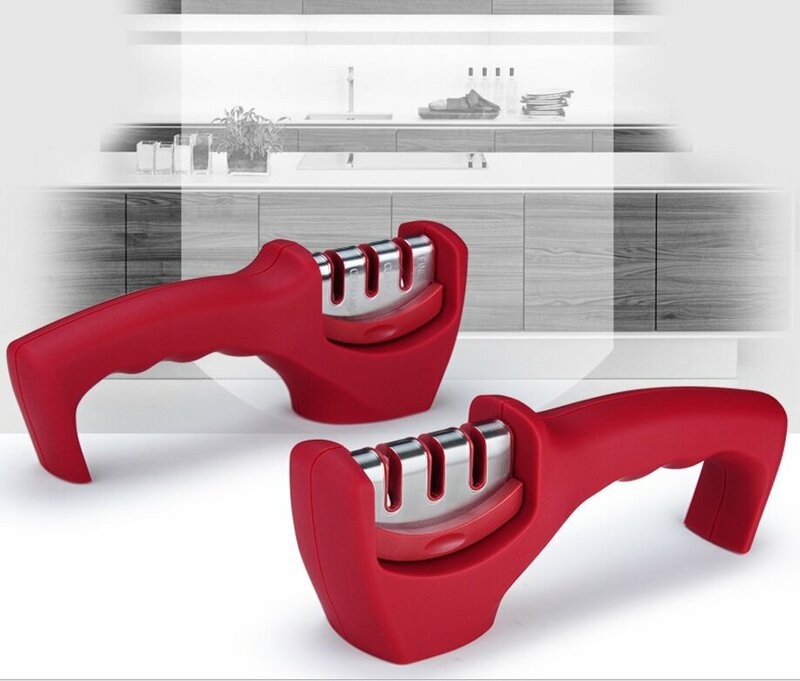 – Quickly sharpens both ceramic and steel blades in 3-4 pulls. – You never have to worry about getting the right angle. 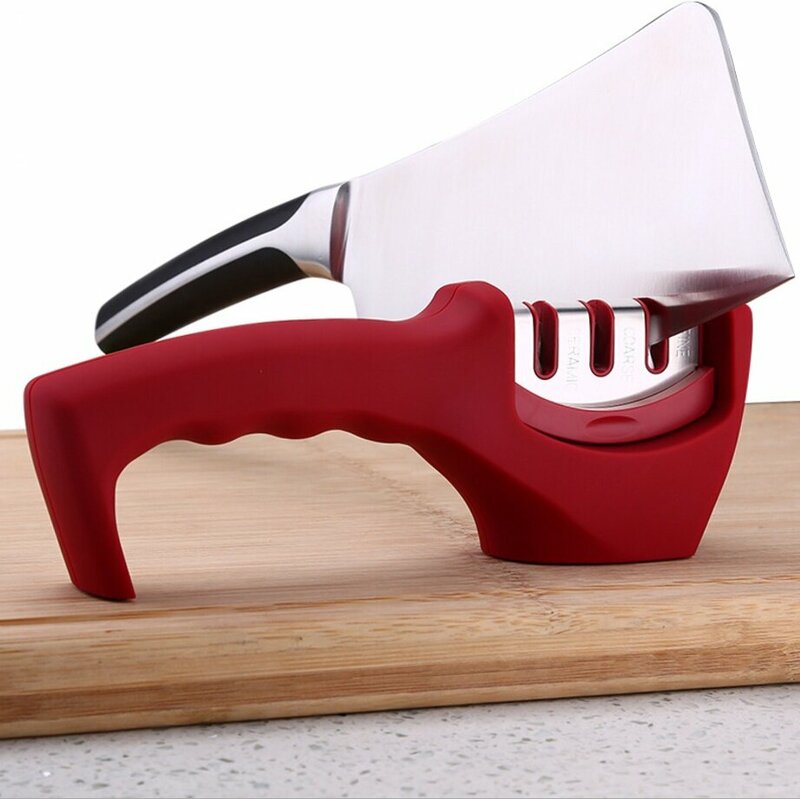 – Accommodates knives of all types and sizes. 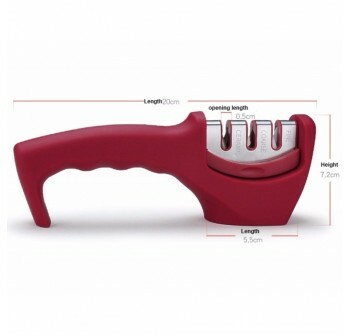 – Carefully designed to prevent accidental cuts. 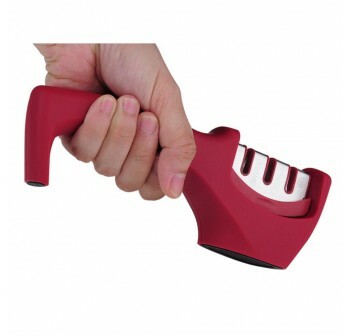 – Made using durable ABS plastic and high-grade sharpening rods. 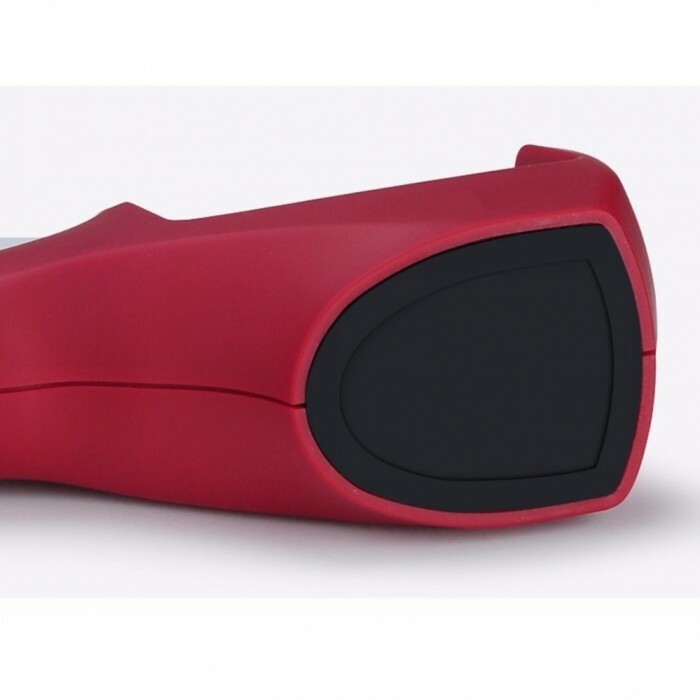 WORKS ON MOST KNIVES: This knife sharpening system hones both ceramic and steel blades and accommodates all sizes including paring, hunting, military, fishing, and folding knives. PREVENTS ACCIDENTAL CUTS: The kitchen knife sharpener is fitted with a rubber base for maximum stability and a long handle to keep your hand away from the blade. 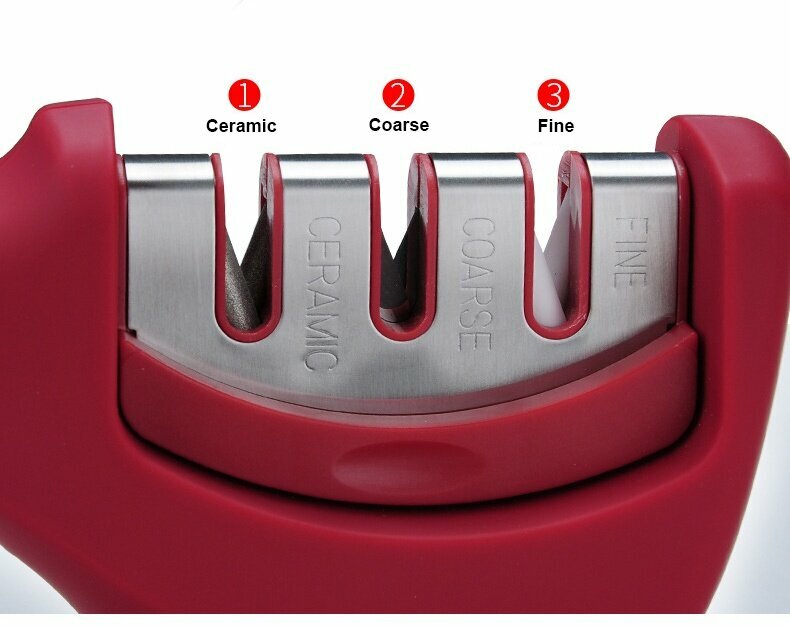 GREAT BUILD QUALITY: Made using durable ABS plastic and high-grade diamond, tungsten carbide and ceramic rods, this knife sharpening kit is designed for total durability.